What? Why? How? Yes, pickled beets and pretty pink pickled eggs. Because they are wonderfully delicious, oh so colorful and good for you! Beets are high in immune-boosting vitamin C, fiber, and essential minerals like potassium (for healthy nerve and muscle function) and manganese (good for your bones, liver, kidneys, and pancreas). Beets also contain B vitamin folate, which helps reduce the risk of birth defects. Beets and beet juice are a unique source of betaine, a nutrient that helps protect cells from environmental stress. It’s also known to help fight inflammation and improve cardiovascular function. A Super Food! Eggs also contain Vitamin D, Vitamin E, Vitamin K, Vitamin B6, calcium, zinc, choline, lutein and zeaxanthin AND eggs raise HDL the good cholesterol. Okay, enough about nutrition, let’s get cooking! 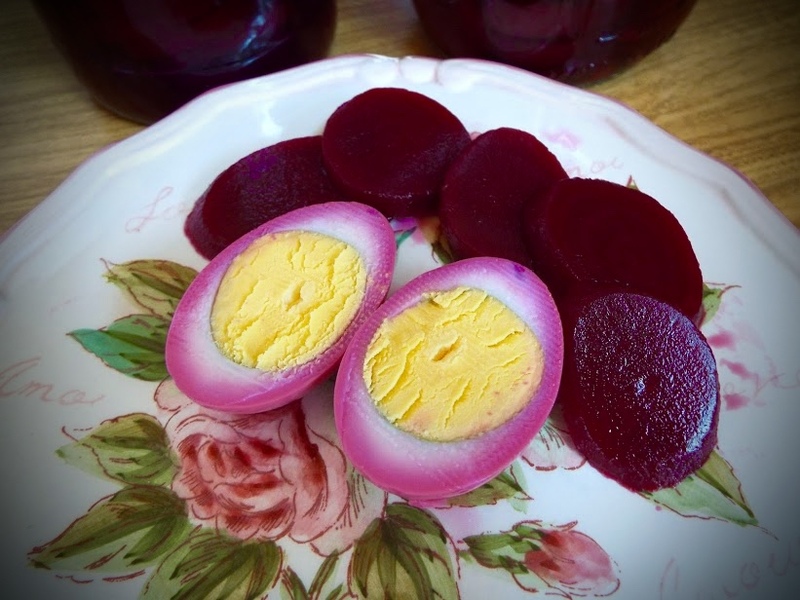 Pickled beets and pink pickled eggs are super easy to make. Just saying “pink pickled beets” is fun and brings a smile to my face. 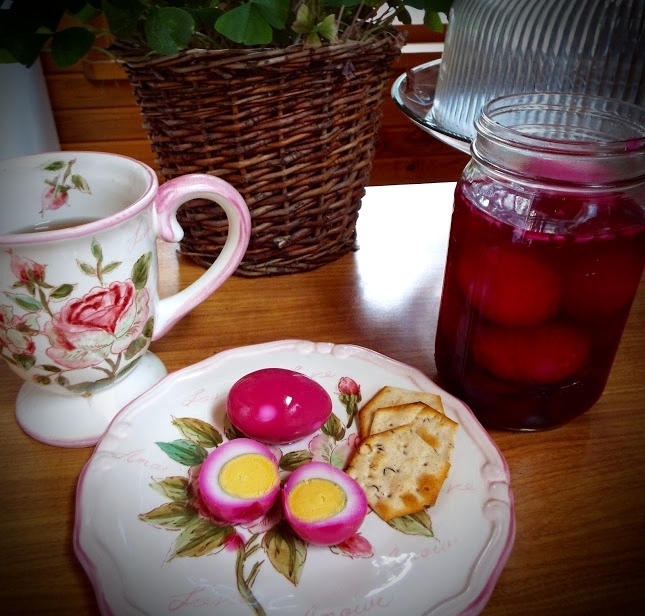 How delightful to eat pretty pink pickled eggs for breakfast, brunch or lunch. See, I can tell you’re smiling! Drain beet juice into medium-sized pot. Add vinegar and sugar to beet juice in the pot. Heat on medium to dissolve sugar. In each quart jar place 1 tsp dehydrated onion, 10 peppercorns, and 1 tsp salt. Empty 1 and a 2/3 cans of the drained beets into 1 jar. The remaining 1/3 can of beets into second jar. Put the peeled hard cooked eggs in the jar with the lesser amount of beets. Carefully ladle hot beet juice into jar of eggs to cover, adding remainder of liquid to jar of sliced beets. Top off with lids and place in the refrigerator for at least 1 day to marinate. They are more flavorful after 2 or more days of marinating.